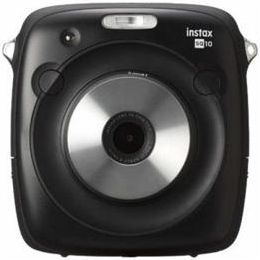 Fuji Film INSSQUARESQ10 ハイブリッドインスタントカメラチェキ "instax SQUARE SQ 10"
Rakuten Super Points 2X POINTS! Buy it and earn 502 points! I can print it with a choice of an image after photography. I adjust an image and can process photography and an image after the photography during indication. I put this brightness adjustment (I can coordinate by 1/3 to +-3) three together and can make a work like oneself. I cope with the division print which puts several images in one piece of film. Built-in memory can store approximately 50 pieces. It supports microSD. Double exposure, valve photography, a macro flash change is equipped with various photography modes. The center placement lens which is easy to take 60 degrees from anywhere reproduces accurate composition. It is most suitable for selfie photography. Approximately 3-4 time (at the time of use of 0.5A Universal Serial Bus port) ※It varies according to temperature. We do not accept returns basically.